Previewer is a premium plugin for Gravity PDF that allows the user to review the PDF(s) before the form has been submitted. The extension goes hand-in-hand with a bespoke PDF or one of our premium PDF templates. 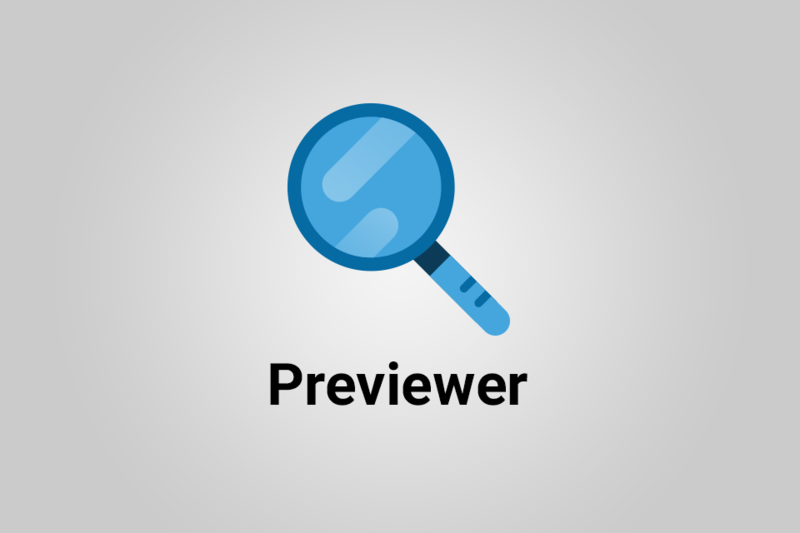 You can purchase the Previewer plugin from our Extension Shop. This guide will walk you through installing and configuring Previewer to its full potential. Please follow our installation guide, which provides instructions for uploading the add-on to your WordPress website and adding your license key for automatic updates. Note: The REST API must be enabled to use this plugin. This extension adds a new field called PDF Preview to the Gravity Forms Editor, and can be found under the ‘Advanced Fields’ section. To correctly setup the Previewer field, you first need to configure a PDF on your chosen Gravity Form. 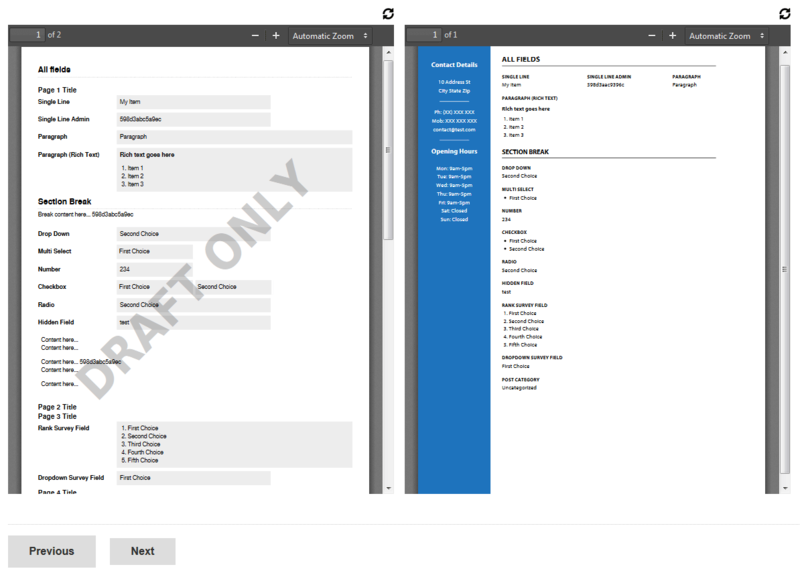 A dropdown that allows you to select one of the active PDFs configured on the current Gravity Form the end user can preview. The height in pixels of the preview should be displayed at. The default height is 600px. The width of the preview will always be 100% and fill the container the form is embedded in. After a PDF is downloaded it’ll automatically be removed from the server. To download the PDF a second time the user might need to refresh the Previewer (whether they do or not will depend on the browser they’re using). You can change the watermark text displayed, and the font. If you’ve got multiple PDFs configured on a single Gravity Form you may want to allow the end user to preview each of those documents. 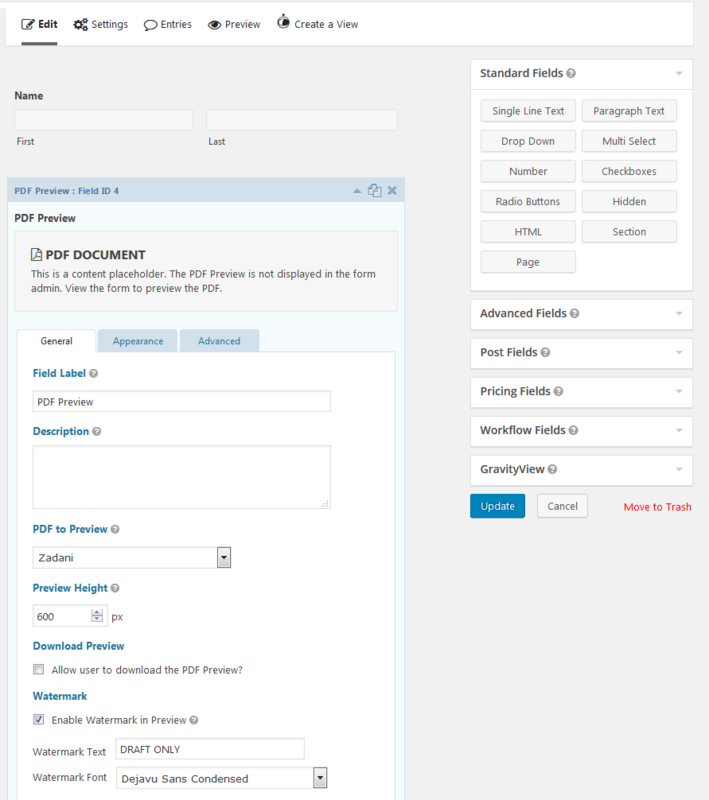 You can add multiple PDF Preview fields to the form and display each of your configured PDFs. Bonus Feature: Use Gravity Forms CSS Ready Classes – like gf_left_half and gf_right_half – to display the previews side by side. Conditional Logic is fully supported for the PDF Preview field. Set it up from the field’s Advanced Tab in the Form Editor. The Previewer is fully-functional with the Gravity Flow (version 2.0+) User Input step, including when using conditional logic on the Previewer or manually selecting which fields to display. It’s not currently possible to use the Previewer during the Approval Step. If using the File Upload field with the Multi-File Upload option disabled, the Previewer will need to be on a different page in the form (using Gravity Forms Page fields) for those uploads to display in the PDF preview. This is a limitation of how the File Upload field works. There’s a bug in PDF.js (the library we use to preview PDFs in your browser) that can cause background images to be blurry in the Previewer. There are two different workarounds available, both requiring modifications to your PDF template.